Grant Sabatier, called "The Millennial Millionaire" by CNBC, is the Founder of MillennialMoney.com, which has reached over 10 million readers. He writes about personal finance, investing, entrepreneurship, and mindfulness and hosts the Financial Freedom podcast. Sabatier graduated from the University of Chicago and has been featured in the New York Times, Washington Post, NPR, Money Magazine,and many others. When not traveling in his VW Camper, he lives in New York City. "Financial Freedom is about a lot more than money, it’s about living a richer life." "Simply put, this book will help you make money. You'll also learn to save, invest, and better manage your money—all good things! I hope you have the foresight to read and apply its many lessons." “Financial Freedom changed my life. Reading it showed me a new way of looking at money and work that's opened my eyes to how life ought to be lived. 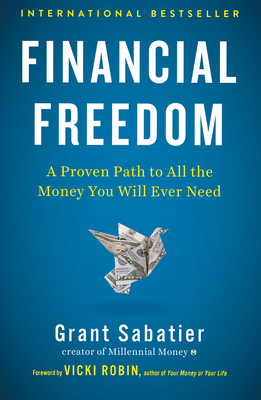 Grant’s book will not only guide you to financial freedom, it’ll teach you to stop being limited by conventions and what you think you can and cannot achieve."